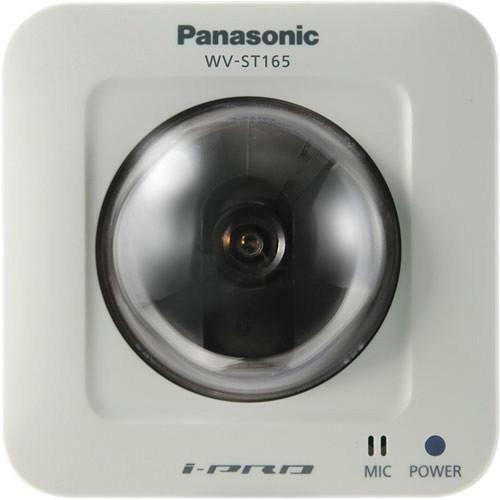 We recommend checking out our discussion threads on the Panasonic WV-ST165 H.264 Pan-Tilt HD Network Camera WV-ST165, which address similar problems with connecting and setting up Wired IP Cameras Panasonic. The user manual for the Panasonic WV-ST165 H.264 Pan-Tilt HD Network Camera WV-ST165 provides necessary instructions for the proper use of the product Surveillance - Surveillance Video - Wired IP Cameras. The Panasonic WV-ST165 H.264 Pan-Tilt HD Network Camera (NTSC) offers high-quality 24-hour video surveillance in both day and night time lighting conditions. Designed for day/night surveillance, this network camera captures clear images at F/2.2 even in locations with a minimum illumination of 0.5 lux (B&W). The Adaptive Black Stretch technology increases visibility of subjects in dark areas of a video scene without compromising the image quality of brighter areas. The face wide dynamic range technology offers blur-free images of the human face. The pan & tilt functionality and preset map shot function allow monitoring of wide area (Horizontal 180°, Vertical 123°). Furthermore, with the progressive scan technology, you can be sure to obtain blur-free images even when the object is in motion. In addition, the UniPhier LSI chip enables this network camera to simultaneously stream real-time imagery in HD resolution of 1280 x 960 at 30 fps. The electronic sensitivity enhancement function Auto (up to 16x) increases the quantity of light stored on the sensor, making the image brighter. Equipped with Digital Noise Reduction technology, the camera filters signals that could result in grainy images. When any movement is detected, alarm sources, including VMD and Panasonic alarm command, trigger actions such as FTP image transfer and e-mail notification. The camera comes with SD/SDHC memory card slot that provides easy way for data backup upon any network failure. As the WV-ST165 camera is Power over Ethernet (PoE) compatible, it can be installed almost anywhere without the need for an additional power supply. If you own a Panasonic wired ip cameras and have a user manual in electronic form, you can upload it to this website using the link on the right side of the screen. Box Dimensions (LxWxH) 10.3 x 6.3 x 5.9"
The user manual for the Panasonic WV-ST165 H.264 Pan-Tilt HD Network Camera WV-ST165 can be downloaded in .pdf format if it did not come with your new wired ip cameras, although the seller is required to supply one. It is also quite common that customers throw out the user manual with the box, or put the CD away somewhere and then can’t find it. That’s why we and other Panasonic users keep a unique electronic library for Panasonic wired ip camerass, where you can use our link to download the user manual for the Panasonic WV-ST165 H.264 Pan-Tilt HD Network Camera WV-ST165. The user manual lists all of the functions of the Panasonic WV-ST165 H.264 Pan-Tilt HD Network Camera WV-ST165, all the basic and advanced features and tells you how to use the wired ip cameras. The manual also provides troubleshooting for common problems. Even greater detail is provided by the service manual, which is not typically shipped with the product, but which can often be downloaded from Panasonic service. If you want to help expand our database, you can upload a link to this website to download a user manual or service manual, ideally in .pdf format. These pages are created by you – users of the Panasonic WV-ST165 H.264 Pan-Tilt HD Network Camera WV-ST165. User manuals are also available on the Panasonic website under Surveillance - Surveillance Video - Wired IP Cameras.